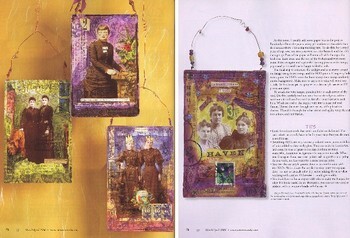 I'm thrilled to have a feature article on my altered cabinet cards published in the latest issue of Somerset Studio magazine! If you're not familiar with Somerset Studio, run to your nearest magazine stand and pick up an issue. Somerset is a gorgeous, high-quality publication dedicated to paper arts and mixed media. 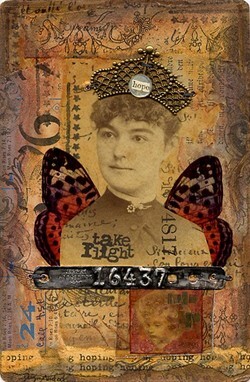 It's loaded with collage, calligraphy, bookmaking, and all kinds of altered art by talented artists from all over the world. It's an honor to be published in such an inspiring and beautiful publication. Thank you Somerset! Inspire Me Thursday: a weekly dose of inspiration to be creative, try new techniques and explore new mediums. We challenge all artists to get out their art supplies, experiment and CREATE! Each Thursday a new challenge will be announced on the site. To participate, create a piece of art inspired by the current week's challenge. Post it to your blog sometime before the following Thursday. Email us or leave a comment and we will add your link to the list of participants. We'll post a few of our favorites on Thursday, as well as a new challenge. Make sure to visit and take the challenge! I've finished my artwork for the second round of the MMCA altered calendar round robin. I've had Sally Turlington's calendar for the last few weeks and am ready to send it on it's way! Her theme was "Not Yo Mama's Michelangelo and DaVinci". I altered several "Mike and Leo" pages and also tipped-in this altered cabinet card "Hoping to Fly". The mini collage at the bottom right is a tiny copy of a collage that Sally herself did. It's only the beginning of the swap but I can already tell it's going to be an incredible experience. Each and every artist involved is extremely talented and the artwork, so far, is beyond expectations! 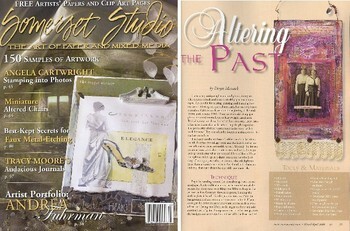 I've posted a photo album of my work in this project to my typepad...see the link at the right. I'll be adding to it monthly as I finish each calendar. Check it out! song (sông, s ng) n.
A brief composition written or adapted for singing. The act or art of singing: broke into song. A distinctive or characteristic sound made by an animal, such as a bird or an insect. A lyric poem or ballad. These artist trading cards were inspired by a beautiful song by Jennifer Knapp called "Whisper My Name". This song is on one of my favorite cd's called "Heaven & Earth; a Tapestry of Worship" and is a collab0ration by five very popular female Christian singers. I keep this cd in my art room and listen to for inspiration while I work. Some of my other musical inspirations? City on a Hill, Led Zeppelin and Pink Floyd...go figure! 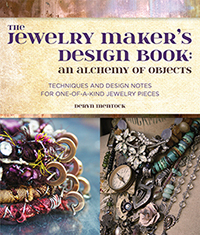 My very talented friend and fellow MMCA member Katie Kendrick has a brand new website! 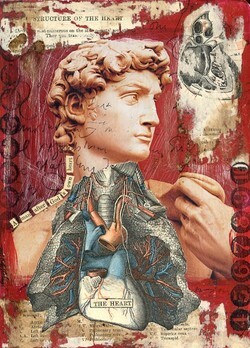 Katie is a mixed media artist who works her creative magic in fabric, paper, paint, photos and various found objects. The intriguing subject matter and spontaneous look of her artwork never fails to draw me in. See for yourself here! I'm finally finished up with my friend Reiny's deco. She asked me to do the cover and, because the cover is usually my favorite part of a project like this, I agreed! I love the deep blue of the window (which is a transfer) in the background. The angel is one I photographed at Evergreen Cemetery in Galveston. 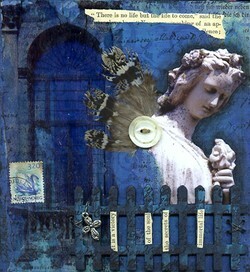 Reiny wanted something dimensional so I added real feather wings to this angel and an antique, mother-of-pearl button. In the foreground is a painted, picket fence, wired on and adorned with text and a metal cross charm. I based the color scheme for this piece on the beautiful swan postage stamp; a gift from a friend in Sweden. Having or composed of only one thing, element, or part. Not involved or complicated; easy: a simple task. Being without additions or modifications; mere. Having little or no ornamentation; not embellished or adorned . Not elaborate, elegant, or luxurious.